I’ve added two new candids of Dakota Johsnon out in New York on October 13. I’ve added two new candids of Dakota Johsnon out in New York on October 12. I’ve added 23 HQ pictures of Dakota out for dinner with her friends Cara Delevingne and Taylor Swift on October 11. 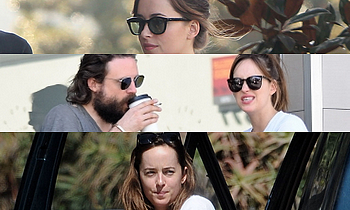 Hello everyone, yesteday (October 05), Dakota Johnson was seen three times in Los Angeles for her 27th birthay. Check the gallery for the HQ photos. Hello everyone, yesteday (september 30), Dakota Johnson is seen leaving a workout session in Los Angeles. Check the gallery for the HQ photos. Hello everyone, yesteday (september 21), after the Gucci Show Dakota was seen shopping in the city. Check the gallery for the HQ photos.